TEMPE, Ariz. (AP) Tra Holder wanted the last shot of the game, and after his team had struggled with shooting and free throws all night, he felt confident his fadeaway bank shot was going in. 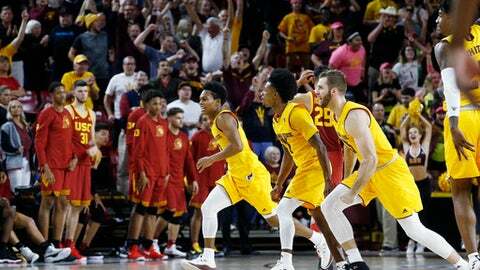 It did, with less than two seconds to play, and Arizona State scored the last nine points of Thursday night’s game to stun USC 80-78. The Trojans had the final possession but couldn’t get off a shot from near half-court. Holder’s 22 points led the Sun Devils (18-6, 6-6 Pac-12 Conference), who won the opener of a two-game conference set for the first time this season after losing five in a row. Shannon Evans added 21 points. The Sun Devils missed 12 free throws for the game and went five minutes without a field goal late in the second half after cutting the USC lead to one. But USC didn’t score in the final 2:28 and committed three turnovers in that stretch. ”That’s the beauty of this, is that we won a game like this and I think we were far from our best,” Sun Devils coach Bobby Hurley said. The Sun Devils trimmed the USC lead to 67-66 on an Evans 3 with 7:11 to play, but the Trojans had an answer. They scored the next eight points, capped off by Boatwright’s 3 at the 5:02 mark. Boatwright, who’d struggled to get into a rhythm early in the game, held his follow-through high for the crowd to see as he back-pedaled on defense. Remy Martin and Kodi Justice hit shots after USC led 78-71, followed by Evans’ 3. The Trojans were out of sorts in the first half, going down 9-2 on a 3-pointer out of the corner from Holder. USC didn’t score for almost six minutes after making its first shot of the game. Arizona State: After facing UCLA and Arizona, both at home, in its next two games, the Sun Devils finish the conference season with two of their four remaining games against teams near the bottom of the standings – Oregon State and California. Arizona State, with a good run of conference wins, still has a shot at a top-four seed and first round bye in the Pac-12 tournament. Arizona State’s Vitaly Shibel, a starter, entered the game averaging just 1.3 points per game in conference play. But he delivered a powerful two-handed follow dunk of a missed shot just before the halftime buzzer cut USC’s lead to 37-33.